Round 12 most important game was a victory of Campo Mourao over one of their biggest challengers UniFacisa 86-79 on Saturday night. It was a good game for American guard Willie Mangum-IV (185-93, college: E.Michigan) who led his team to a victory with 22 points. Marciel Santos (200-91) contributed with 13 points and 10 rebounds for the winners. American forward Reggie Larry (198-86, college: Boise St., agency: Pro Sports) replied with 16 points and 5 rebounds for UniFacisa. Both coaches used bench players which allowed the starters a little rest for the next games. Campo Mourao have a solid three-game winning streak. They maintain second position with 7-5 record having just two points less than leader Londrina. UniFacisa at the other side keeps the fourth place with six games lost. They share the position with Cerrado. Campo Mourao are looking forward to face Cerrado (#4) in the next round. UniFacisa will play against the league's leader Londrina and is hoping to prove to their fans that the loss was just an accident. An interesting game for Londrina (9-3) which hosted in Londrina second-best Sao Paulo FC (6-5). First ranked Londrina managed to get a 14-point victory 92-78. Worth to mention a great performance of Argentinian point guard Stefano Pierotti (185-98) who helped to win the game recording 23 points and 6 assists and Ricardo Azevedo who added 23 points and 5 rebounds during the contest. The best for the losing side was center Joao Vitor (213-98) with 28 points and 9 rebounds (on 13-of-16 shooting from the field). Sao Paulo FC's coach Claudio Mortari rotated ten players and allowed the starting five to rest. Londrina maintains first position with 9-3 record. Newly promoted Sao Paulo FC dropped to the third place with five games lost. Londrina will play against UniFacisa (#5) in the next round. Sao Paulo FC will play against Rio Claro and hopes to get back on the winning track. Liga Ouro top team - Londrina (9-3) managed to deliver another win on Saturday. This time they beat fifth ranked Cerrado (6-6) 85-76. The winners were led by Stefano Pierotti who scored that evening 15 points and 5 assists. Even 16 points, 6 rebounds and 8 assists by Patrick Vieira did not help to save the game for Cerrado. Cerrado's coach Ronaldo Pacheco tested eleven players in this game, but that didn't help. Londrina maintains first position with 9-3 record. Cerrado lost third consecutive game. They dropped to the fourth place with six games lost. They share the position with UniFacisa. Londrina will meet UniFacisa (#5) in the next round. Cerrado will play against the league's second-placed Campo Mourao and it may be a tough game between close rivals. The game between 5th ranked Cerrado (6-6) and seventh ranked Pato Basquete (4-7) in ended with biggest points difference. Guests from beat Cerrado 93-76. The best player for the winners was Isaac Thornton who scored 31 points, 7 rebounds and 5 assists. 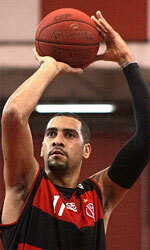 Pato Basquete maintains seventh position with 4-7 record. Cerrado lost third consecutive game. They dropped to the fourth place with six games lost. Pato Basquete's next round opponent will be bottom-ranked Blumenau (#8) at home. Cerrado will play against the league's second-placed Campo Mourao (#2) where they are definitely not considered as a favorite in this game either. An interesting game for Londrina (9-3) which hosted in Londrina second-best Sao Paulo FC (6-5). First ranked Londrina managed to get a 14-point victory 92-78. Worth to mention a great performance of Argentinian point guard Stefano Pierotti (185-98) who helped to win the game recording 23 points and 6 assists and forward Ricardo Azevedo (201-83) who added 23 points and 5 rebounds during the contest. Four Londrina players scored in double figures. The best for the losing side was center Joao Vitor (213-98) with 28 points and 9 rebounds (on 13-of-16 shooting from the field) and American guard Jalen Jones (188-95, college: UT Arlington) scored 17 points and 7 rebounds. Sao Paulo FC's coach Claudio Mortari rotated ten players and allowed the starting five to rest. Londrina maintains first position with 9-3 record. Newly promoted Sao Paulo FC dropped to the third place with five games lost. Londrina will play against UniFacisa (#5) in the next round. Sao Paulo FC will play against Rio Claro and hopes to get back on the winning track. The game between 5th ranked Cerrado (6-6) and seventh ranked Pato Basquete (4-7) in ended with biggest points difference. Guests from beat Cerrado 93-76. Pato Basquete made 19-of-23 charity shots (82.6 percent) during the game. Pato Basquete outrebounded Cerrado 38-26 including 27 on the defensive glass. The best player for the winners was American guard Isaac Thornton (190-91, college: Fairmont St.) who scored 31 points, 7 rebounds and 5 assists. 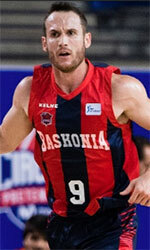 Guard Rafael Castellon (192-85) chipped in a double-double by scoring 15 points and 12 rebounds. At the other side the best for losing team was point guard Patrick Vieira (186-93) who recorded 18 points and 7 assists and American forward Evan Zabriski (198-94, college: Allegheny) added 18 points and 9 rebounds respectively. Four Cerrado players scored in double figures. Pato Basquete maintains seventh position with 4-7 record. Cerrado lost third consecutive game. They dropped to the fourth place with six games lost. Pato Basquete's next round opponent will be bottom-ranked Blumenau (#8) at home. Cerrado will play against the league's second-placed Campo Mourao (#2) where they are definitely not considered as a favorite in this game either. Round 12 most important game was a victory of Campo Mourao over one of their biggest challengers UniFacisa 86-79 on Saturday night. It was a good game for American guard Willie Mangum-IV (185-93, college: E.Michigan) who led his team to a victory with 22 points. Marciel Santos (200-91) contributed with a double-double by scoring 13 points and 10 rebounds for the winners. American forward Reggie Larry (198-86, college: Boise St., agency: Pro Sports) replied with 16 points and 5 rebounds and his fellow American import point guard Nate Barnes (178-90, college: Alders.-Broad.) added 14 points in the effort for UniFacisa. Both teams had four players each who scored in double figures. Both coaches used bench players which allowed the starters a little rest for the next games. Campo Mourao have a solid three-game winning streak. They maintain second position with 7-5 record having just two points less than leader Londrina. UniFacisa at the other side keeps the fourth place with six games lost. They share the position with Cerrado. Campo Mourao are looking forward to face Cerrado (#4) in the next round. UniFacisa will play against the league's leader Londrina and is hoping to prove to their fans that the loss was just an accident. Liga Ouro top team - Londrina (9-3) managed to deliver another win on Saturday. This time they beat fifth ranked Cerrado (6-6) 85-76. Londrina had a 35-23 advantage in offensive rebounds. The winners were led by Argentinian point guard Stefano Pierotti (185-98) who scored that evening 15 points and 5 assists and guard Gabriel De-Oliveira (191-96) supported him with 16 points and 6 rebounds. Four Londrina players scored in double figures. Even 16 points, 6 rebounds and 8 assists by point guard Patrick Vieira (186-93) did not help to save the game for Cerrado. American forward Evan Zabriski (198-94, college: Allegheny) added 17 points and 9 rebounds. Cerrado's coach Ronaldo Pacheco tested eleven players in this game, but that didn't help. Londrina maintains first position with 9-3 record. Cerrado lost third consecutive game. They dropped to the fourth place with six games lost. They share the position with UniFacisa. Londrina will meet UniFacisa (#5) in the next round. Cerrado will play against the league's second-placed Campo Mourao and it may be a tough game between close rivals.